My name is Victoria and I have been Queen of England for over sixty-three years. 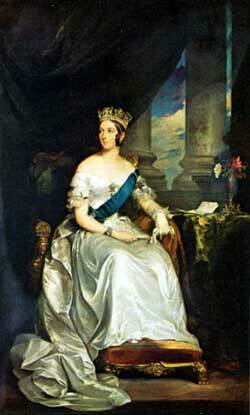 I became queen in 1837 at eighteen years of age upon the death of my uncle, William IV, King of England. Because I have seen much during my long reign, I would like to take you on a short personal tour of my time as Queen. After my coronation in 1837, many people in England were not happy. Many people say that I have a rather strict and formal personality., a sharp temper, and a very stubborn attitude for getting done what I want done. To all of this I say. "Really"? These very qualities they dislike are absolutely necessary for a ruler to possess. The first ten years or so of my reign were largely uneventful with the exception of a rebellion by individuals known as the Chartists (1842) who claimed to want election reforms to give common people the vote. It is unfortunate that these poor, uneducated people would do this. Quite obviously, they really don't know what is in their best interest. In 1852, we had some trouble in Burma with the native peoples who didn't want to be part of our empire. This, I cannot understand. It is not plain to these foreign subjects that the British Empire is the best thing that could have happened to them. We bring them civilization, modern medicine, Christianity and trade, and all we ask for in return is that they allow us to rule them and do what is best for them. Why they revolt against such a benign policy I cannot understand.. 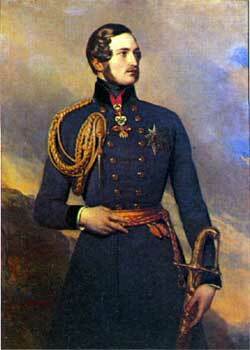 The next major trouble was in the Crimea in 1854. The Russians were trying to expand their empire at the expense of the Turks; we and the French had to step in and help the rather weak Turks against the Russians. We also didn't want the Russians getting too strong, so this action served us well in two ways. The most ghastly event occurred in India in 1857, the Sepoy revolt or Indian Mutiny. During this time thousands of Indian troops in the English army revolted, attacked their white officers and any other English troops or white Europeans who were in India. The slaughter was horrible; these Sepoys butchered, with swords, thousands of innocent English women and children, not to mention the soldiers and men they killed. We sent troops in and crushed the revolt, killing most of the leaders, some of whom were hanged publicly and allowed to rot as a message to others who might consider another rebellion. There have also been revolts and wars in Africa against the Ashanti (in 1873 and 1895) on the west coast of Africa and with the Zulus (1879) in South Africa. In both cases, we were attempting to bring order to our colonies there. In 1899, we entered a war against the Boers (Afrikaners) in South Africa that really upset me. These Dutch settlers wanted to form their won country in South Africa and refused to be a part of the English colony there. There wanted full rights to the mineral rich Transvaal. What made this war so upsetting was the ruthless guerilla war tactics used by the Boers, who after all, were white men, not savages. The last major problem I have had was in China (1900) where a group of individuals wanted to expel and kill all Europeans there. These Boxers, as they were called, were supported by the Empress Dowager, and were finally defeated by a force of allied European nations from Germany, Italy, France, England, Russia and the United States. We were glad when it was over. Not only have there been political events in our colonies but we also have attempted to help our people at home. We enacted the Mines Act of 1842 that forbade the employment of women and children in coal mines. We shortened the workday to ten hours, for six days a week and we established a Public Health Act in 1875 to improve sewers, water, and housing for the poor. We provided for increased public education through the Education Act of 1870. All of this was done to improve the position of the average Englishman. Since I am now eight-one years, I will finish our tour because I have become tired; but I feel that I have done an excellent job as queen. The empire doubled in size during my reign and the people of the world are much better off because of it. Queen Victoria was born on May 24, 1819. She was the daughter of Prince Edward, Duke of Kent, minor son of the reigning King George III, and Victoire of Saxe-Coburg, a German princess. Both her father and grandfather died in 1820, the year her uncle succeeded as King George IV. When George died without issue in 1830, Victoria stood to inherit the throne after the daughter of her second royal uncle, King William IV, died in infancy. William himself died in 1837, and the eighteen-year-old princess became Queen Victoria of Great Britain and Ireland on June twenty that year. Victoria was a virgin queen until February 10, 1840, when day she married her cousin, Prince Albert of Saxe-Coburg Gotha. Victoria bore nine children within the next seventeen years, among them the future King Edward VII. Albert was an avid patron of the arts, sciences, and burgeoning industries, and he helped organize the famous Great Exhibitionof 1851 at the "Crystal Palace." Victoria doted on her husband, who influenced her greatly and became her most trusted adviser in matters of state. The other major influence early in her reign was her first Prime Minister William Lamb, second Viscount Melbourne, of the liberal Whig party. These early years of Victorian rule saw major reforms in British education, with the Grammar Schools Act of 1840 and the founding of Queen's College for women in London in 1848. When Prince Albert died in 1861, the queen was devastated and went into deep mourning. She rarely appeared in public until the end of the 1860s, and during this time Great Britain saw a major movement in favor of republican government and for the abolition of monarchic powers. However, with the help of the Conservative party's Benjamin Disraeli, prime minister in 1868 and again from 1874 to 1880, the queen eventually reassumed a more public and influential role in the government. Throughout the middle years of her reign, Victoria presided over Britain's involvement in the Crimean War (1854-56), non-intervention in the Prussia-Austria-Denmark war of 1864-1866, and the aversion of a Franco- German war in 1875. She also presided over major domestic reforms in the British government, including the Second Reform Act of 1867 and the Representation of Peoples Act of 1884, both of which greatly expanded the population of her subjects permitted to vote in parliamentary elections. Victorian England also saw great advances in commerce and industry, aided by the spread of railroad lines throughout Great Britain and the laying of the first trans-Atlantic telegraph cable in 1866. During Victoria's reign, the British overseas Empire achieved its greatest size and power. The queen added the title Empress of India to her crown in 1876. She was a strong supporter of empire, which often pitted her against the Liberal party's William Gladstone, prime minister from 1869-1874, 1880-1885, and again from 1886-1894. She had better relations with her last prime minister, the Marquess of Salisbury, also a strong supporter of empire and opponent of Irish Home Rule, which was one of the most contentious issues of the day. Victoria lived to celebrate both her Golden Jubilee in 1887 and her Diamond Jubileein 1897. These events were celebrated as great public affairs, and by this time the queen had achieved great popularity in Britain and she had come to be seen as the great symbol of the British Empire. The last years of her reign were preoccupied with the Boer War in southern Africa (1899-1902). After sixty-three years as queen - the longest reign of any English monarch - Victoria died on January 22, 1901. She was eighty-one years old.